Micalann McCrea signs her letter of intent to play basketball at MSU Billings. Ronan Maiden Micalann McCrea skies above defenders during post-season play last year. 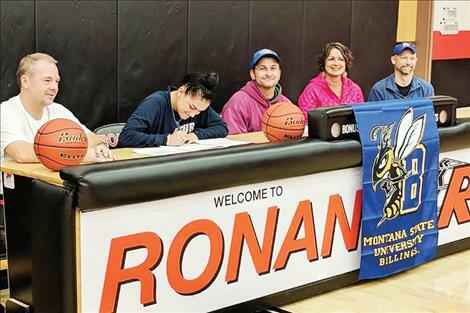 RONAN – Micalann McCrea made her posthigh school decisions official and signed her letter of intent to play women’s basketball for Division II Montana State University Billings on Wednesday, the first day recruits could sign for the Class of 2018. At MSU Billings, McCrea plans to major in business management. Last season, McCrea earned all-state recognition while playing for the Ronan Maidens, who fell in the early rounds at state but finished the season as the Western B divisional champions with an overall 23-2 record. 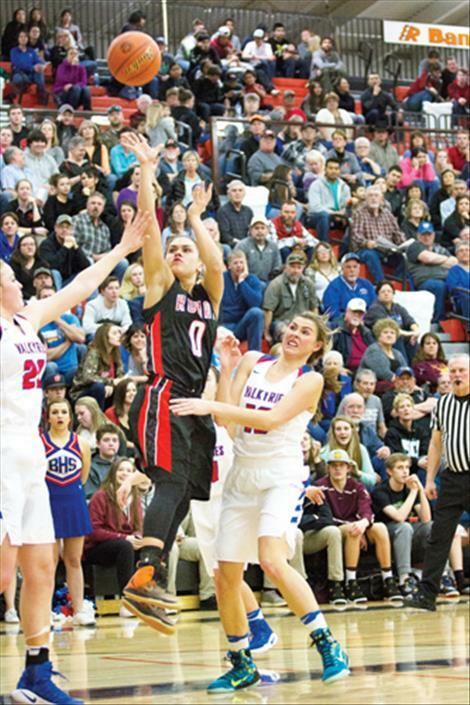 McCrea and Ronan’s new head coach Steve Woll are hoping to get back to state this season, but the team will have their work cut out for them due to some key senior graduations and their return to class A competition. The Maidens will start the new season by competing in Missoula at the tip-off tournament Dec. 8-9 and will hold their season home opener against Browning at the Ronan Event Center on Dec. 15.